"71st International Rice Festival Poster"
"71st International Rice Festival Poster" was a design completed as an entry in a local fall festival poster contest. The poster design was a combination of stipple work and some line art work, with the bulk of the work done in stipple. 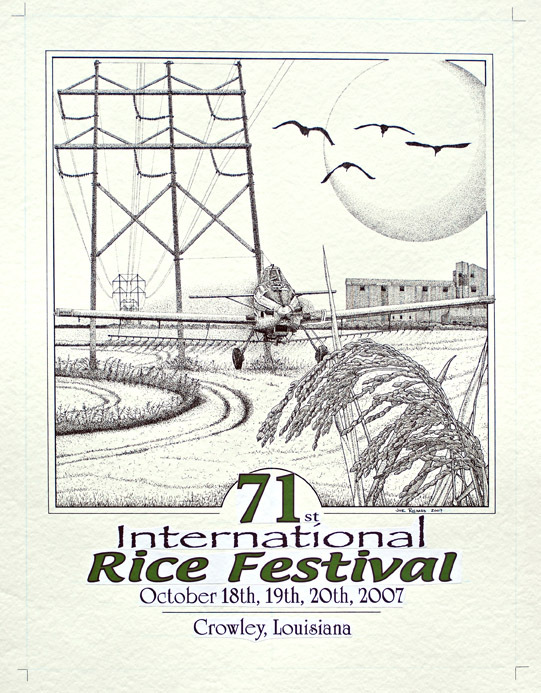 Extensive use of stippling effects combined with some line art was used to create a dramatic finished design as an entry in the "71st International Rice Festival " poster contest. This work took 30+ hours to complete and measures 18 x 24 inches on a 22 x 28 inch background. This artwork was done on heavy duty, acid free water color medium paper. This is a first for this artist on this medium. This design is a combination of ideas derived from a series of images taken by ths artist in the local area. The images taken are of crop dusters at work, rice dryers, rice fields and the hazards to the work of crop dusters -- high tension lines. All were combined in the hopes of telling a story as opposed to the usual festival poster that uses mostly montages of the local landmarks, etc. I figured that the idea would be worth the try. The contest will be judged the first week of August.